While the tastes of the period favored the gilt bronze sculptural work of artisans like Ghiberti, often the available resources didn't allow for the commitment that such ornate bronze work demanded. 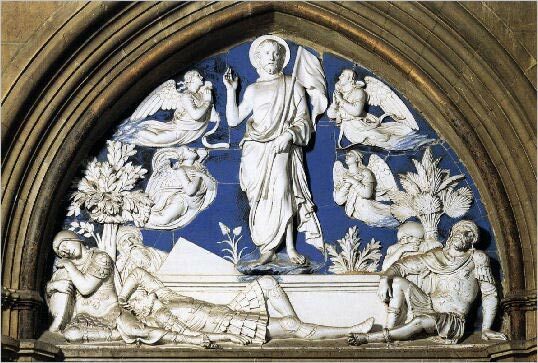 Luca dell Robbia work as a master in glazed terra cotta, a cheaper alternative and as such a popular medium during the period. This work in relief demonstrates the incredible, lifelike details possible with that material, and show why works in terra cotta gained such popularity.